We took a ride to Seward to show Fred the port city and check on a Kenai Fjord tour. After spending a few enjoyable hours touring the town, we headed back to Cooper Landing and saw an awesome sight. When we were about 8 miles out of town driving through the woods, I glanced up to my right and saw an eagle flying towards the truck about 30 ft away. I yelled to Maureen and Fred and we watched as the eagle, in the position depicted in the borrowed picture above, swoop down to our right within a couple of feet. As we passed, it dove behind the truck, it grabbed some road-kill and flew into the woods. We were struck speechless for a few seconds amazed at what we had just seen. 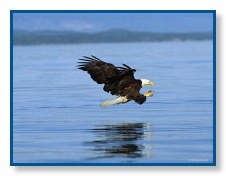 Of all the creatures we see up here, we think that the bald eagle still is the most captivating.